Developed by Microgaming, Thunderstruck II is the sequel to Thunderstruck with far better graphics and bonus features. The game is based on Norse mythology and features Norse Gods such as Odin, Loki, Valkyrie, and Thor. Thunderstruck II features 5 reels with 243 Ways to Win and a variety of bonus features including four free spin rounds, wild multipliers, random bonus rounds and a top paying jackpot worth 2.5 million coins. Centralizing the popular Norse mythology theme are four Norse Gods. Loki is considered the mischief maker while Valkyrie decides who will be next to die. Odin is renowned for being the king of the gods and Thor wields his mighty hammer and takes the role of being the god of thunder and lightning. The city of Asgard and the famous Longship also make an appearance on the reels to complete the set of standard symbols featured on the reels. Thunderstruck II doesn’t feature any standard pay lines but does provide 243 Ways to Win. The lowest bet you can place on a single pay line starts at £0.01 and can be increased to a maximum of £0.25. This video slot features 10 coin levels, and the maximum coin level will cost you £75.00. The Thunderstruck II icon serves as both the wild symbol and a multiplier. It will substitute for all standard symbols except the scatter symbol. The Hammer icon represents the scatter symbol and unlocks the Great Hall of Spins feature in the game. The Valkyrie bonus is always unlocked and includes 10 free spins with a 5x multiplier. The free spin feature can also be re-triggered. This features awards 15 free spins and an extra wild symbol. If you display a Wild Magic symbol on reel three, you can transform up to 14 regular symbols into Wild Magic symbols that will stand in for other regular symbols. You will receive 23 free spins and spinning a winning combination will activate the Wild Raven feature. Once the Wild Raven feature is activated, two ravens will fly over the reels and transform random symbols into multiplier symbols which can stand in for other symbols. The multiplier values range between 2x and 3x your bet size. Thor’s Bonus starts you off with 25 free spins and spinning a winning combination will trigger the Rolling Reels feature. Once the Rolling Reels feature is triggered, the symbols that formed a winning combination will shatter and disappear to make way for new symbols falling from above, creating more winning opportunities. The game also presents a Wild Storm bonus feature that is randomly activated and converts up to 5 reels into wild symbols. 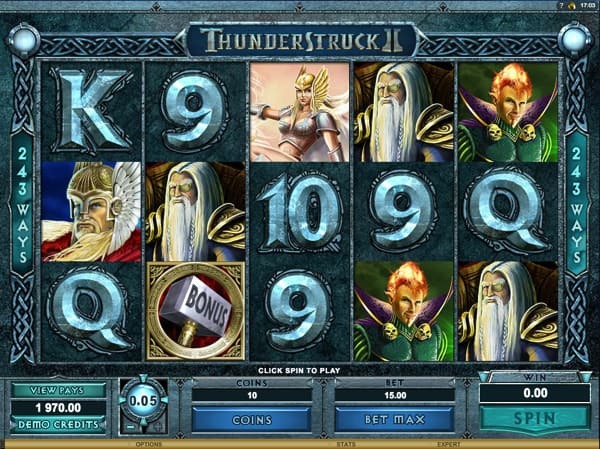 Thunderstruck II is a remarkably well-balanced video slot featuring a medium variance with the potential to produce some extraordinary wins while indulging in some amazing bonus features. The prizes gained from the Great Hall of Spins are absolutely enormous and even though it takes a while to unlock the different sets of free spins, it’s well worth the effort at the end. You can play a demo version of Thunderstruck II for free below. If you want to play Thunderstruck II with real money, then we recommend Dunder Casino and Casumo Casino.